This means there’s a great opportunity for you to create content that’s going to be of help to someone else. And some early birds realized this and flew with it and are now minting millions, and it’s not too late. Statistics show that YouTubers are greatly influencing generation Z’s (the generation that follows millennials) buying habits as well as their career paths. Millennials on the other hand check YouTube at least once a day on average. Since its inception in 2005, YouTube has evolved to become the second most visited site on the web just behind Google with over 1.3 billion users uploading around 300 hours of video every single minute. It has also grown beyond just a video sharing platform to a complete search engine. And the main reason as to why it keeps growing each day is because it’s very beneficial in terms of problem solving as well as entertainment. 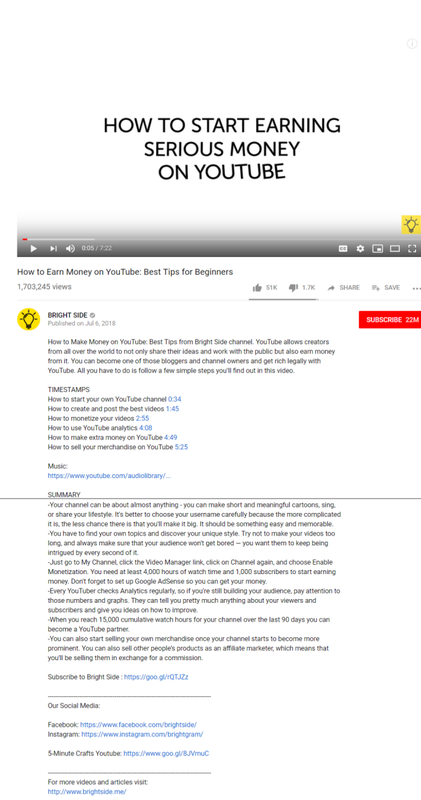 So, before jumping into the nitty-gritties of how to get money from YouTube, it’s important to understand a few tips and strategies that you should first consider. As with every project that you may intent to undertake, you must have primarily a strategy. A strategy is your most important step before going any further. Here are a few strategies you should consider. Decide how you want to benefit from YouTube. It could be that you want it as a promotional outlet for your brand (whether goods or services) or you might be trying it to evaluate how to make a living from YouTube direct through revenue generating content. This will determine the kind of videos you create. You can monetize YouTube videos based on views and subscribers. The more engagement and following, the more effective it will be in terms of ad space. One sure way of creating a connection with your viewers is by having a specific theme. This means by the time they come to you, they already know what to expect. Consider your channel as a story and your videos the flow. When trying to pick your niche it’s best to first consider things that you’re passionate about, gifted at or popular for, as well as who your ideal target audience will be in terms of gender, age, location and such details. This way you’ll have an easier time focusing, curating and having consistency. You can consider looking at related channels to see how they’re doing it. Create a schedule that will be achievable depending on how long it may take you to create the videos and how long it may take you to edit. Consistency in your frequency will provide your audience with a clear understanding of when they can expect content from you, and this is how you’re taken seriously. Pick a day and a consistent time and stick to it. You most likely have one or more social media profiles that has some (or lots of) following. Start there by letting them know you have something good going on. You can also include your YouTube channel link on the bios of your profiles. Another good place would be your email list, send them an email letting them know about your content with a link through which they can follow your channel. Identify creators within your niche with whom you can co-create some content with, or with whom you can both compare or refer to each other’s highlights. This will grow your fan base and engagement level and eventually have an impact on your conversion rates, quite an easy way to make money YouTube. A call to action here is very important, so ask your audience to share, like and subscribe to your channel because what you need is high engagement and viewership. The more activity there is around your channel, the more it will show up in searches. So, at the end of your video, remember to request your viewers to share, like and subscribe. You may assume that because this is a video you don’t need to go the whole nine yards as far as keywords are concerned. But just like blog posts, you need to identify the keywords that will be relevant to you and stand out. Why you need to have these keywords before creating your video, is so that you can incorporate them in your script. Having a keyword repeated several times in your video will help in YouTube search ranking. You don’t want to go out of your way to create great content for no one to see. Again, this is about YouTube ranking. Remember as said above, YouTube is the second largest search engine, so you will have to optimize your video titles and descriptions by including the keywords at the beginning of the video. The descriptions have to be catchy but with just enough keywords. Do not over stuff or you will get penalized. YouTube likes it when an audience stays longer on your channel because this means more ads and thus more revenue for them. It’s for this reason that the YouTube video analytics can show you at what point your users abandon your videos on average. So, the use of YouTube cards to recommend your related videos at the abandonment stage may ensure that the audience stays on your channel longer (and of course on YouTube). It’s beneficial to also encourage engagement by responding to your audience, this way you’ll learn more about what they want and use this to improve your content. Again this plays a huge role in your domain authority and ranking. Initially, it’s pretty ok to shoot your videos using your smart phone. Just avoid shaking too much and creating blurred images. But as you progress, invest in better equipment (doesn’t have to be expensive). You could also include a stand to stabilize your camera. At the end of the day, no one wants to watch shaky blurry videos; they will just click to a related channel irrespective of how great your content is. With all these tactics and tips in hand, you’re now ready to get into the real business of making money from YouTube. So, here are the main steps you can take to achieve this. There are a couple of ways you can use to earn money on YouTube. As an advertiser, you will pay YouTube for TrueView ads, Pre-roll or Bumpers to get your content to potential buyers. While as an ad platform, you will create content that will be good enough to eventually host others’ content as a paid affiliate or YouTube partners as well. TrueView is an ad format where the viewer is given options e.g. to skip the ad after 5 seconds etc. sponsors only pay for ads viewed in full or up to 30 seconds. Pre-roll is a non-skippable promotional video message that plays just before the content the user has selected to view. Bumpers are six second non-skippable ads that pay per view like TrueView. So, the above two are like umbrella methods under which several other distinct approaches can be used in monetizing YouTube. If you’ve made a name for yourself and have gained an active audience, you will have followers that will be happy to spend their money on your merchandise. If you have your own products such as apps, eBooks, music or even art, you can promote them on YouTube in countless ways. All you need to do is create a video of the products or services and then add the URL to your website or the site where the viewers can make the purchase of the products. Such merchandise could include t-shirts, backpacks, diaries and much more. When you creatively brand your merchandise and give it a unique personality, you’re able to capture your audience’s attention and you gain exposure and eventually a huge fan base that will be more than happy to be associated with your products, therefore they will buy. Traffic is a big deal if you have a blog or site. The number of visitors on your site determines the number of opportunities your brand has. The more traffic, the more opportunities to spread your idea/ product, generate qualified leads and more conversion opportunities. By having a URL in your YouTube, you’re able to funnel your YouTube traffic to your site or blog. This means earning a commission by selling other people’s products on YouTube. So how to earn money from YouTube as an affiliate marketer or influencer? Well statistics show that 94% of marketers using influencer marketing are finding it most effective because they generate up to eleven times higher ROI compared to traditional advertising methods. For this reason, brands are investing more in these kinds of marketing because an influencer or an affiliate marketer already has a reasonable and loyal following which depending on the product is often already defined demographically, and this is what they take advantage of. Your work includes reviewing your affiliate’s products on videos, creating tutorials and also engaging your viewers to get feedback from them. So, when you do a superb job in promoting these products, you end up getting great deals from these companies. The key thing to remember is to include your affiliate’s links to earn your credit for the sales done. Crowd-funding on YouTube is quickly gaining popularity as a model for funding projects for creatives and artists. Here people go to a specific page on a website e.g. Patreon and donate money. For this to work, you, of course, must have built a loyal following with regular and consistent quality content production. Your work is supposed to inspire your fans enough for them to be willing to pay cash to help you produce more. This is a new way of capitalizing on your fans database, you invite them to fund and support your activity and your content creation process via a small monthly subscription fee of their choice. And one of the few ways on how to make money from YouTube without AdSense concerns. In a world with endless possibilities, you could have some very unique video clips that can stir the internet and go viral instantly. This could be a short film, a continuing story or insights. You can offer the media the license to such content in exchange for money. Besides the media, you could list your videos in a marketplace for example Juken Media where your videos will easily find the right people to purchase. The moment you create a name for yourself and gain a substantial audience, sponsorship deals will come knocking on your door. Corporates will come to you if they are aware, they can benefit from linking to your channel. Which means the larger your audience size is, the bigger the sponsorship you’ll be able to negotiate. Other brands may just require you to use their product in your videos, e.g. wearing their branded watch, riding in their branded car or using their branded gadgets, whatever it could be (even sipping a cup of branded coffee). This is product placement and when you take this a notch higher and recommend these products in your video, you get paid for endorsing them. This is one way on how to make money from YouTube views. A large audience that draws inspiration from you is as good as a mainstream media. Can you make money on YouTube by becoming a partner? Not directly, but it presents you with a great platform to monetize your content and begin to share in the advertising revenue. Being a partner gains you access to your viewers in-depth analytics and ad-clicking. You get special framed Play Buttons once you reach a certain level of subscribers e.g. a silver Play Button for 100,000 subscribers etc. If you wish to become a YouTube partner, you will go to the channel menu and pick Creator Studio. Here your account is verified and monetization enabled. Thereafter you’ll be required to have an AdSense account to get into Google’s advertising network to be able to get paid and view your revenue reports. Controversial issues and sensitive events such as graphic imagery, death and tragedies, terrorism or extremism, war or political conflict material are not suitable for ads. Videos ads containing harmful or dangerous acts that can result in physical, psychological or emotional injury is not suitable for advertising. Drugs and dangerous products or substances cannot be promoted as ads on YouTube; however educational, documentary or artistic purposes are generally suitable for advertising as long as drug or substance abuse is not glorified. Inappropriate language or hateful content that promotes any kind of discrimination such as ethnic orientation, nationality, gender etc. are not suitable for advertising. Sexually suggestive content is not suitable. There are many ways on how to make money from YouTube, whether as an advertiser or as a partner. The important thing is to have an objective that will be backed by strategy and tactics. Consistency in high quality and relevant content will ease your efforts in building a large fan base, and that is one of the pre-requisites of monetizing YouTube. It is said that video is king, but YouTube wears the crown, but the truth is without you and the next content creator, YouTube wouldn’t have any crown. Passive income, making money online or just otherwise than having a regular job? Did that cross your mind? How many times have you dreamt of becoming your own boss and quit your 9 to 5 boring job? I know I did and I am sure you have thought about it at least once. They are not too many those who dare to start their own business or working from home.